Looking for classroom, laboratory, or field activities? Search the peer reviewed collection. This covers all teaching activities in all SERC-hosted projects that have passed peer review. You can limit the topic using the Subject box on the right as well as do a free text search across the collection. or broaden your scope and Search the entire collection. Look for specialized activities collections within the individual websites across SERC. 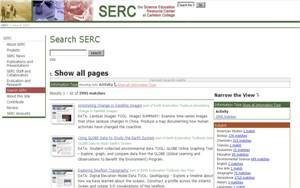 Find a SERC site that addresses your topic. The site guides on the left can help: especially the guides to introductory courses, upper level courses and popular topics. That page will allow you to search through a smaller collection of activities focused on that site's topics. Activity sheet example. Click to view this activity sheet. 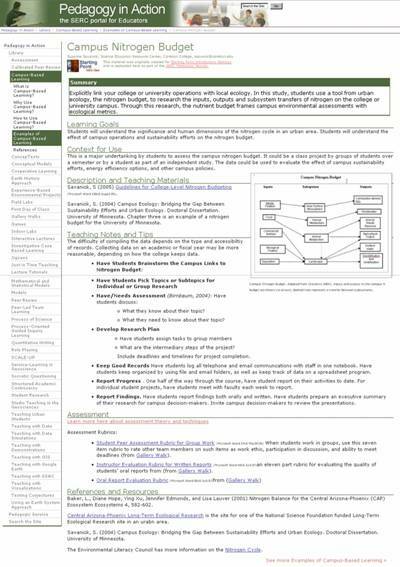 Most activities on SERC-hosted sites are presented in a standard one-page format. This format was expressly designed to encompass the key information that will enable fellow educators successfully implement or build on an activity.